Omar “El Panterita” Figueroa Jr., the undefeated (26-0-1, 18 KOs) former World Champion Boxer, will begin his ring walk on Saturday night honoring the brave men and women in the military who have lost their lives protecting the U.S. with a walk of silence. 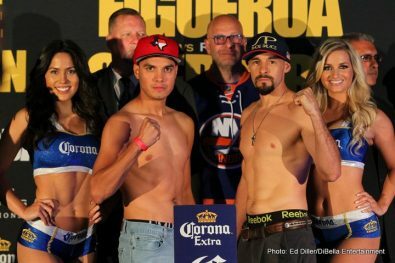 Figueroa takes on Robert “The Ghost” Guerrero live on “Premier Boxing Champions” on FOX and FOX Deportes from NYCB Live at the Nassau Veterans Memorial Coliseum. In lieu of his normal walk-in music, Figueroa’s tribute will be a ring walk of silence honoring all military members who have given their lives to protect the U.S. He also commissioned a tribute shirt that he will wear that has the names of the seven Navy sailors from the USS Fitzgerald who lost their lives at sea on June 15. 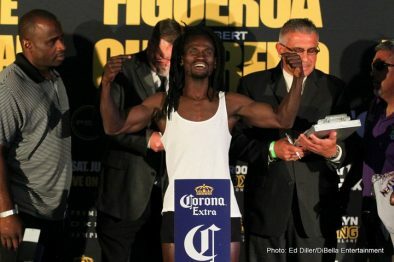 Figueroa has a pre-fight tradition of honoring a person or cause before his fights, having worn shirts in support of cancer patients and charity organizations in the past. Tickets for Figueroa vs. Guerrero can be purchased online by visiting www.ticketmaster.com, www.nycblive.com, or by calling 1-800-745-3000. A match-up between exciting former world champions Omar “El Panterita” Figueroa (26-0-1, 18 KOs) and Robert “The Ghost” Guerrero (33-5-1, 18 KOs) headlines an action-packed night of Premier Boxing Champions on FOX and FOX Deportes on Saturday, July 15 in the first boxing event at the newly-renovated NYCB LIVE, home of the Nassau Veterans Memorial Coliseum. Televised coverage begins at 8 p.m. ET/5 p.m. PT from the first boxing event at the Coliseum since Mike Tyson headlined in 1986. 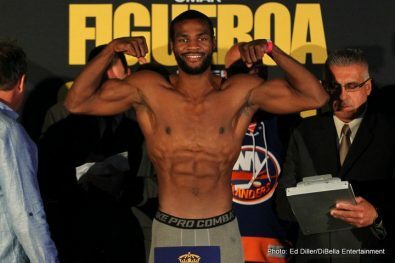 The FOX and FOX Deportes broadcast will see unbeaten contender “Sir” Marcus Browne (19-0, 14 KOs) battling undefeated Long Island native and fan favorite Seanie Monaghan (28-0, 17 KOs) in a light heavyweight showdown. 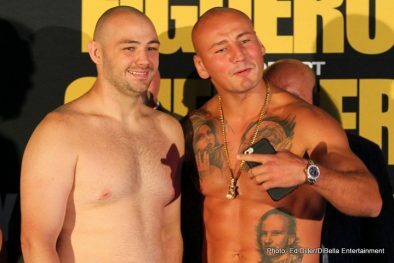 Also televised in prime time, Artur Szpilka (20-2, 15 KOs) meets Adam Kownacki (15-0, 12 KOs) in an all-Polish heavyweight showdown that promises fireworks. Tickets for the live event, which is promoted by DiBella Entertainment, start at $50 (not including applicable fees) and are on sale Thursday, May 25 at 10 a.m. ET. Tickets can be purchased online by visiting www.ticketmaster.com, www.nycblive.com, or by calling 1-800-745-3000. Tickets are also available at the Ticketmaster Box Office at NYCB LIVE beginning Friday, May 26 at noon. Group discounts are available by calling 516-231-4848. A high volume puncher with an exciting style, Figueroa has returned to training with Joel Diaz in California leading up to this fight and looks to make his presence felt on July 15. Representing Weslaco, Texas, Figueroa is undefeated since turning pro in 2008 and won a lightweight world title by defeating Nihito Arakawa in a 2013 Fight of the Year standout. He followed that victory up with successful defenses against Jerry Belmontes and Daniel Estrada. 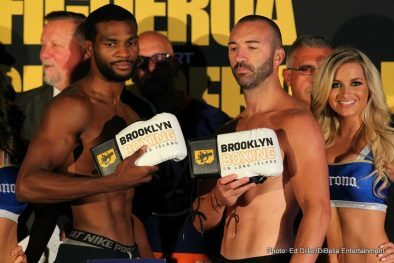 The 27-year-old most recently defeated former world champions Ricky Burns and Antonio DeMarco in his last two outings. Born and raised in Gilroy, Calif., Guerrero is always in exciting contests having gone toe-to-toe with Danny Garcia in a FOX main event in 2016 and Keith Thurman sandwiched around a hard fought victory over Aron Martinez. Prior to 2015, the 34-year-old picked up victories over Andre Berto, Secluk Aydin and Michael Katsidis while winning world titles in multiple divisions. The brawling warrior has been in several “Fight of the Year” candidates throughout his career, including a memorable brawl in Southern California with Yoshihiro Kamegai in 2014, and he also challenged former pound-for-pound king Floyd Mayweather in 2013. The undefeated Browne enters this fight after an electrifying performance in February that saw him drop former title challenger Thomas Williams Jr. before knocking him out in round six. The 26-year-old defeated previously unbeaten Radivoje Kalajdzic in April 2016 after a big 2015 that saw him defeat veteran contenders Gabriel Campillo, Aaron Pryor Jr., Francisco Sierra and Cornelius White. The 2012 U.S. Olympian fights out of Staten Island, New York after an exceptional amateur career that saw him win the 2012 U.S. Amateur Championship at light heavyweight. 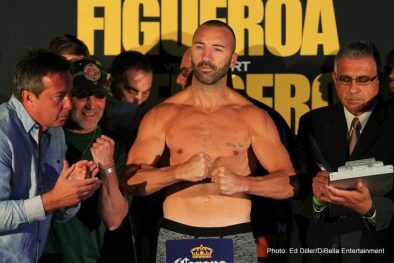 One of the most popular fighters representing Long Island, Monaghan looks to solidify his first world title shot when he faces Browne on July 15. Monaghan competed in the 2009 New York Golden Gloves before turning pro, reaching the final before dropping a memorable contest to fellow Long Island-native Joe Smith Jr. He has yet to taste defeat in as a professional while battling a slew of veterans eager to test his championship mettle. Monaghan added two more victories in 2016 as he stopped Janne Forsman in five rounds and beat Fernando Castanedo in December. The always entertaining Szpilka returns to the ring after a defeat at the hands of heavyweight world champion Deontay Wilder in 2016 as he attempts to get back on the path towards world title contention. 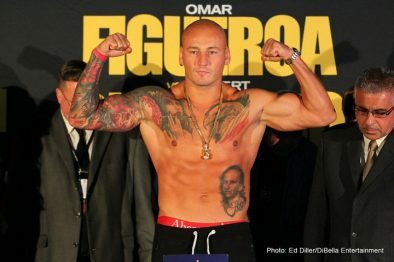 The aggressive-minded 6-foot-3 Szpilka, had a four-fight win streak entering the Wilder bout as he picked up a 10-round unanimous decision over former cruiserweight world champion Tomasz Adamek in 2014 and stoppage victories over Yasmany Consuegra, Manuel Quezada and Ty Cobb in 2015. A two-time New York Golden Gloves champion, five of Kownacki’s last six victories have come at Barclays Center and he now hopes to bring that winning mindset to the Coliseum. 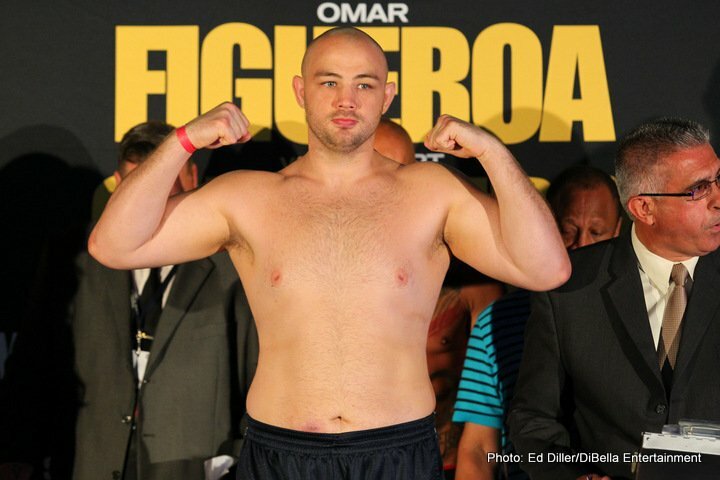 Originally from Poland but now living in Brooklyn, Kownacki stopped previously once-beaten Joshua Tufte in January of this year after 2016 saw him earn a stoppage of Jesse Barboza in June and a decision over Danny Kelly in January. He will take on the toughest test of his career in his countryman Szpilka. South Texas’s Omar “El Panterita” Figueroa, a former lightweight world champion, heads into training camp on a balmy 118-degree day in Indio, CA, home to his trainer Joel Diaz and his new boxing home-base since January. 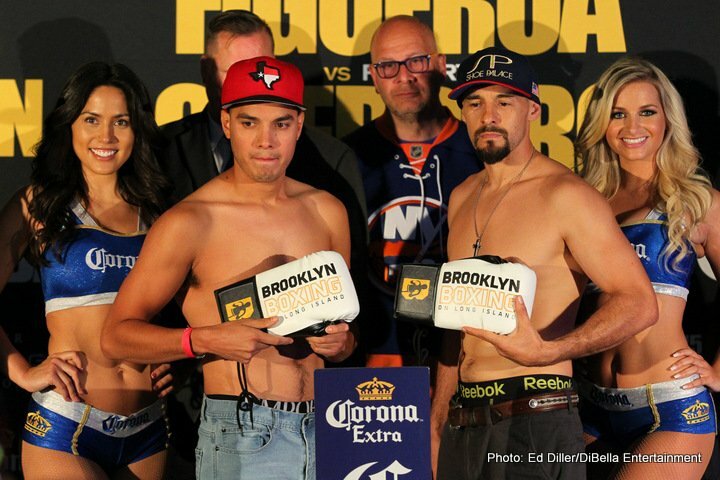 Figueroa re-enters the boxing ring on Saturday, July 15 when he takes on former multiple-division world champion Robert “The Ghost” Guerrero in the 147-pound main event of Premier Boxing Champions on FOX and FOX Deportes at 8 p.m. ET/5 p.m. PT in the first boxing event at the newly-renovated NYCB LIVE, home of the Nassau Veterans Memorial Coliseum. The break that Figueroa took saw him embracing his Weslaco, Texas home, which sits right on the border to Mexico. 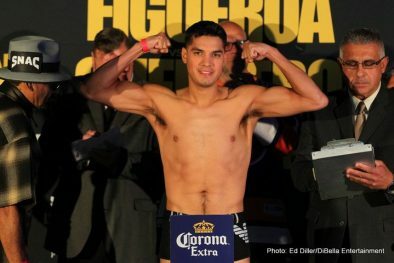 It was a reset that had been coming for a fighter who fought in both Mexico and the U.S. as an amateur before turning pro after his first semester in college. It’s a break that Diaz, who Figueroa first trained with three years ago, agrees with. The two made a plan during his break to have the young fighter come from his Weslaco, TX home to California for an extended training period in preparation for his next fight, as well as set up his camp. 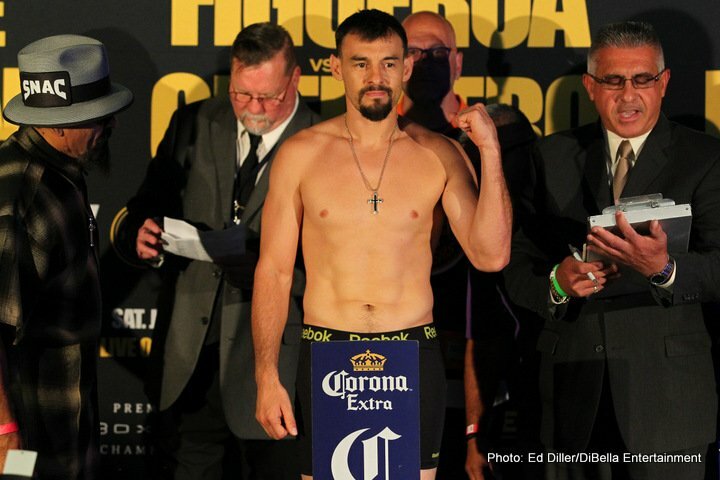 Figueroa faces a tough opponent in Robert Guerrero when he steps back in the ring. Not only is Figueroa fighting above his normal weight-class, but he’s also fighting a former world champion across multiple weight-classes known to be a tough and cunning opponent. “Guerrero is one of the toughest challenges for any boxer. 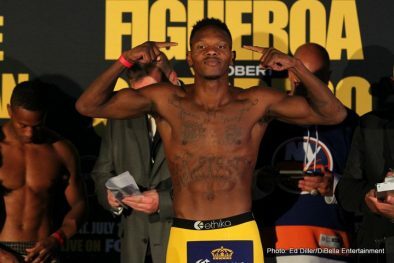 He is a tough fighter, he doesn’t back down and he doesn’t quit,” said Figueroa. “You have to go into the fight knowing it’ll go the full 12 rounds and there won’t be any easy moment in the fight. But I’m prepared for that, it’s what I’ve been training for and it’s who I am. “I’m excited and grateful to be part of bringing boxing back to the Nassau Veterans Coliseum and I plan to set a high standard. 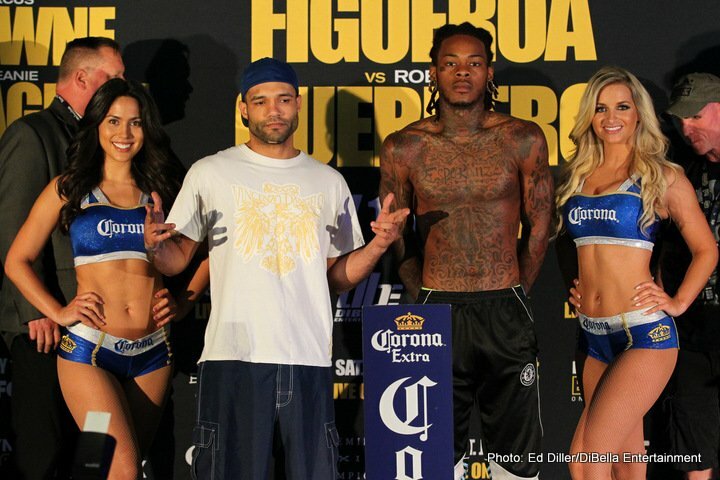 When you have fights in this arena, you know they are going be memorable,” added Figueroa. “January 1 I was back in the boxing mode. Training, running, focusing on diet and getting ready and into camp. The break has given me more focus and the opportunity to change my camp up. “My health and the time training have been great. I’m getting more and more excited for the fight as I’m getting prepared for it. It’s on my mind. “I don’t plan ahead; I don’t look to next fights. I look at the now and think about future fights after this one. I want to make sure I’m healthy. “This is my first time fighting in New York, I expect the New York crowd to be ready for a good fight, because that’s what they’ll see from me. “I’m in this sport for the fighters, my pride and my work. I take a lot of pride in what I do and I am not trying to fight for a trophy nor am I in it for myself. I’m in it for my fighters. This is work and I’m here to take full responsibility for the fighters in my program. I’m here to make my fighters champions in life, not just the ring.